Construction on the basement apartment is continuing. In my first post on the project, I discussed some of the obstacles I was facing as I transformed a dank and crappy basement unit into something someone will be proud to live in. Well, since then, there’s been a significant amount of progress. Insulated pot lights are in. Framing is complete. Sound proof insulation is in. The entire unit was re-wired, and I brought it up to code. Part of bringing the electrical up to code included replacing the breaker panel with a new one, and completely eliminating all of the knob and tube electrical that was in the place. So – all this to say, this past couple of weeks was about the bathroom. The old bathroom sucked. It was like a bathroom in a plane. After literally taking the entire place down to the beams, I framed a proper stand up shower stall that was a perfect square, versus the angled and uncomfortable one that was there before. I opened up the bathroom significantly by having a plumber pin some elaborate pipe work against an interior wall, creating a bigger space to have a bathroom. Check out the picture to the right here. This is a glimpse of what it used to look like. I didn’t even want to take a full photos of the catastrophe. What’s up next? 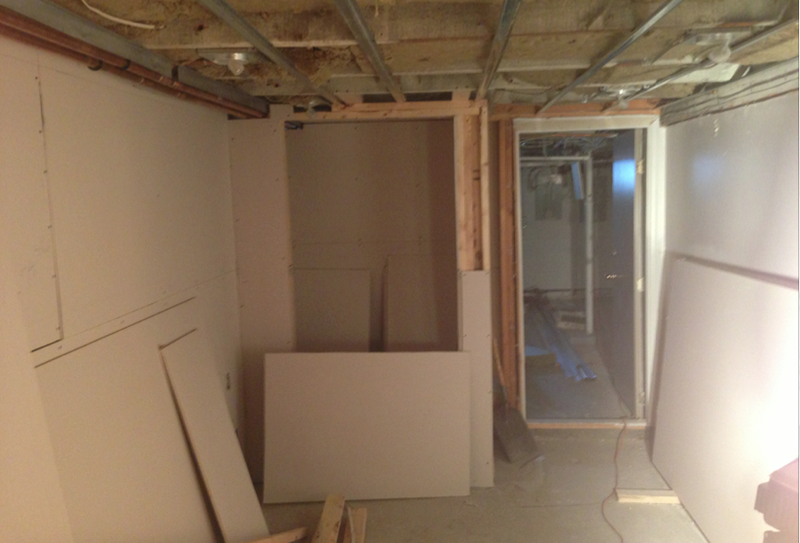 Well – drywalling is continuing into this week. Tile work is being done in the bathroom next week, and I’m going to be purchasing some appliances in the next couple of weeks for the kitchen. All in all, on schedule. I’m planning on having the place available for rent for September 1st.